Step One: Choose the music. Pick 3 or more songs that you love. Step Two: Create a space. Find an area that has some open space. Carefully move away any delicate or breakable items. Ask for help if you need to move anything heavy. Set up a cd, tape, record player or radio. Collect a few items that remind you of a forest such as leaves, pictures of trees in books, toy trees or live plants. Place them in the center of the space. Step Three: Gather your family and/or friends. Pretend that each person is a tree in the same forest. Everyone shares what kind of tree he or she would like to be. Step Four: Play! Take turns being in charge of the music. While the music is ON, everyone gets to dance or do any yoga poses they wish. When the music STOPS,everyone stands tall and still with feet together in mountain pose. Next, take a deep breath in and out. Then, slowly begin to grow into a tree. Grow millions of roots into the Earth. Spread your toes apart. Feel your roots reaching down and drawing in nutrients from the soil of the forest. Make your center as strong as the trunk of a tree. Place the sole of one foot on the inside of the other leg, either below or above the knee. Find your balance by keeping your roots spread wide and your center steady. Use the forest objects in the middle of the space to focus on. Try to look at one item the whole time. When our eyes get still it is much easier to balance. Grow branches up and out in all directions. 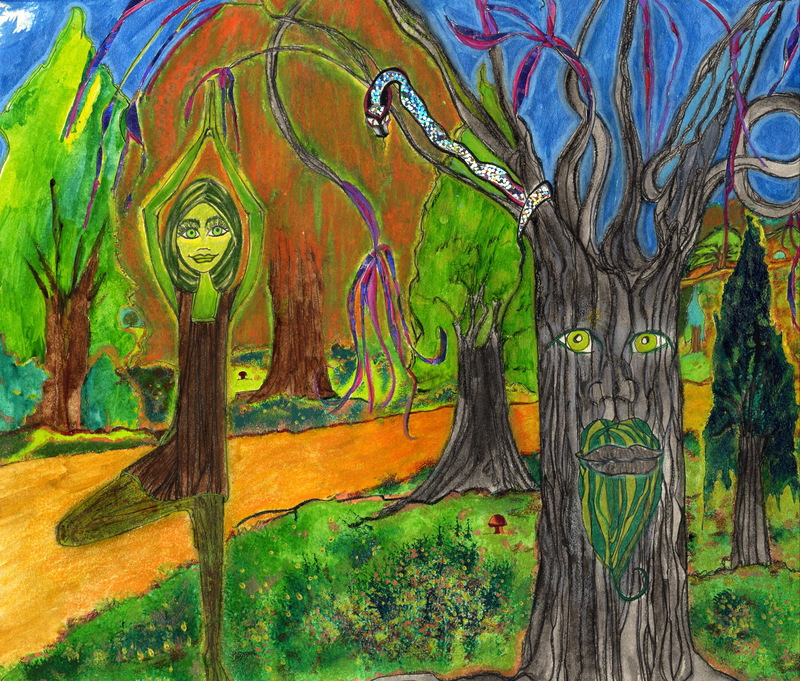 After a few moments of tree pose, start the music again and begin be a dancing tree. Repeat as many times as you wish. BE SURE to change legs each time you practice tree pose. Remind each other when the music stops to switch sides. Try lots of different kinds of music. All kinds of music can work; slow and peaceful or fast and rhythmic. One variation is to keep the feet rooted to floor while the music is on and move the rest of the body like a tree bending in the wind. If tree pose is easy, try closing your eyes! Name your forest. Imagine what kinds of creatures and plants will live there. Try this game at birthday parties, sleepovers and even at school. You can also play this game in a real forest making your own music with instruments and voices. This article is reprinted from the Kids on the Mat section May 2006 issue of Yogi Times. Over the next week, I’ll be posting additional columns I wrote for the magazine. Sometimes when sharing with people that I teach yoga to kids, the response is: “That’s cool. Can kids really ‘do’ yoga?” With a deep breath and steady eyes, I reply that kids can not only ‘do’ yoga, they can BE yoga and, in fact, they ARE yoga. We all are! We’re just all at different phases in the process of recognizing that beauty. Investigation into the art of teaching kids yoga reveals that there are multitudes of ways to engage kids authentically in yoga practice. In Deborah Rozman’s book, Meditating With Children, she offers the idea that imagination is the part of our being which lives closest to the soul. Most children still have direct access to their imaginative faculties, a gift that so many of us let weaken over time. To keep that channel alive and open is an important element of unification within our being. Of course, there are challenges to sharing yoga with kids. For instance, encouraging kids to remain supine during savasana can be very interesting. In search of creative ways to successfully facilitate this essential portion of the practice, the instinct emerged to imaginatively engage student’s minds during the process of letting go of the physical body. Hence the bowl full of yoga was born. The next time you feel inspired to share a bit of calm, relaxing time with your young ones, I invite you to read the following meditation aloud slowly, pausing for a few seconds between sentences. Start sitting on the floor and have a blanket handy. Cup your hands as if you are holding a special bowl. This is your yoga bowl and right now it is full of yoga. Slowly lie down on your back and place the imaginary bowl on your belly. Be careful not to spill the yoga. Make your body comfortable while you take deep, smooth breaths. Feel the bowl moving gently as you breath in and out. Rest peacefully and still while you picture in your mind what your bowl looks like. Remember, if you wiggle around the yoga could spill out one drop at a time. If you are very still, you will have a bowl full of yoga when we are finished. Visualize what the bowl looks like and what it is made of. Imagine what size it is and how it feels. Notice its’ color and any designs, patterns and textures. Look inside of the bowl to see what your yoga looks like. Pretend that you are resting inside of the bowl now and experience what it feels like to be surrounded by yoga. Now take a couple of deep, slow breaths. It’s good for the bowl to move with your breath, in fact that makes the bowl stronger and more able to hold yoga. Imagine that you can offer this bowl full of goodness to someone who needs it. Who will you offer your bowl to? When you are ready, take the bowl into your hands and put it beside you. Roll to one side and use both hands to lift yourself up to sit. Enjoy a few moments of sharing the visions of the bowl and have art supplies on hand to create a memory of the experience. Invite students to think about sharing their bowl of yoga with others.